In the Hudson Valley of NY, 14% of the farms grow a wide variety of fruits and vegetables with 12% of the farms incorporating greenhouse and or nursery production. Vegetable production continues to be a large component in Hudson Valley agriculture with 40% of the farms in NY that produce cauliflower, eggplant, melons, okra, turnips and nectarines producing in the Hudson Valley. 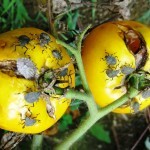 Brown marmorated stink bug on tomato. Our recent focus in vegetable production research has transitioned from conventional onion to pepper and tomato. 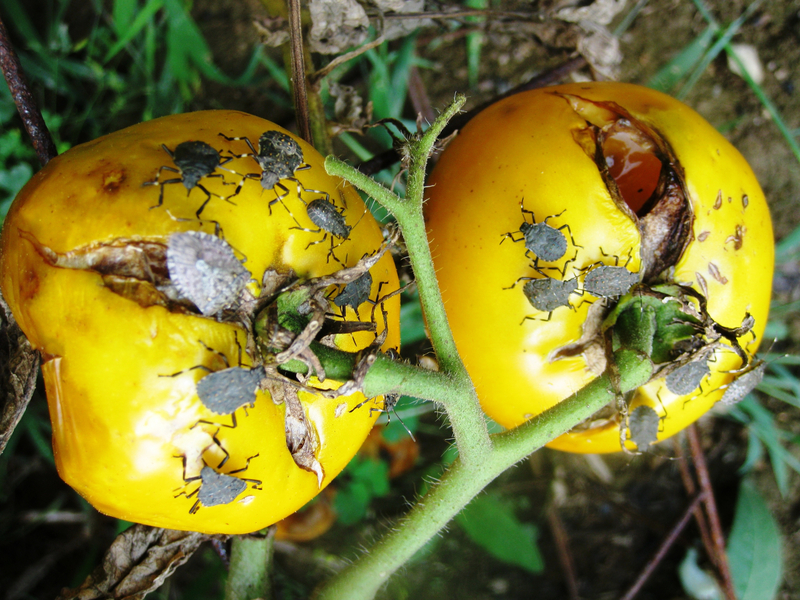 Most of our research has been focused on controlling the brown marmorated stink bug using OMRI approved organic insecticides in field and laboratory bioassay studies. Results have demonstrated low levels of mortality of both adult and nymph stages of the BMSB using most organic insecticides with the exception of the fungal pathogen, Beauvaria bassiana, which provided 80% mortality in directed applications of adults and nymph populations. Weekly sweet corn extension outreach alerts are provided to producers to provide insect monitoring information, pest predictive modeling data and recommendations on control measures. Onions are one of the most important vegetable crops in New York in terms of crop value with approximately 12000 acres planted. The principle type of onion grown is the pungent yellow globe, and most are produced on muck (high organic matter) soils in Orange County and western NY. Costs of production are higher for onions than any other vegetable crop in New York. Several insects and numerous diseases attack onions, and control of these currently relies on intensive insect, disease and wed pest management as onions grow poorly with weeds. Presentation on management of onion maggot, seed corn maggot, onion bulb mite, onion thrips and Iris Yellow Spot.